Brad has been working with Tom since 1987. He takes care of our internet sales and also maintains our website. Check out his customer reviews you will enjoy buying a car from him! 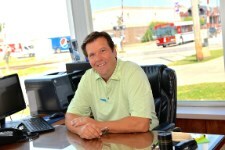 Dan has worked at Tom Sparks Auto since 1991. You will have a great experience buying a car from Dan! Just ask around town. Ruben has been working with Tom since the early 80`s and he will shop around and get you the best financing arrangements possible. Nancy has been working with Tom since 1991. Nancy does everything from answering the phones to running the office and keeping us all in line. Thank goodness we have her! Marc has been working with Tom since 1998. He is in charge of everything that has to do with our Auto repair shop. We are sure that you will be happy with his level customer service. Bob is the smiling face you will see when you bring in your car for auto repair. He has been with us since 2004 and will make sure your car gets done right, and that your completely satisfied. 1997 was a good year for us! That is when master mechanic Chuck joined our team, and he sure has been a valuable for us. I don`t think there is many things with 4 wheels that Chuck can`t fix. Ryan is our go to guy back in the shop he has been here since 2001 and can do most anything around here from repairing cars to filling in at parts or helping customers. He always gets the job done. Steve has been working with us since 2017. He keeps our cars looking good and is able to help out in quite a few areas.